Q: What time will you arrive? A: We clean from 8:30 a.m. until 4:30 p.m. While we cannot tell you the exact time of arrival, we can give you an estimated time (generally a 3 to 4 hour window). You may certainly request a service time and we will do our best to schedule service near that time. Q: Do you guarantee your service? A: All of our work is guaranteed. If you are not satisfied with our service, simply call JSCS within 24 hours of service and we will come back and clean the area you are not satisfied with. No refunds. Q: What if I need to reschedule? A: Please call as soon as you know you have to reschedule. A minimum of 24 hours notice is required for any changes to avoid a $25.00 cancellation fee. Q: How is price determined? A: The fee is based on many factors. The main criteria would be the size of the house, number of bathrooms, the frequency of the cleaning, number of people and the number of pets. Q: What happens if something is damaged or broken by a house cleaner? A: We make every effort not to break items, however, accidents can happen. If something were to be damaged, the team leader will leave a note explaining the situation. If a note has not been left, notify JSCS within 24 hours if damage is discovered. We will make arrangements for reasonable replacement or repair. Q: What if I forgot Johnny Sparkles was coming? A: If you provide a key to your home, there shouldn’t be a problem. If JSCS is unable to enter your home, you will be charged a $25.00 lock-out fee. Q: If I give you a key, how will it be protected? A: All keys are marked with code #’s (No names or addresses) on each key and handed out to the team leader on day of service. Your key is securely stored in our office and only the office manager has access. Q: Do I need to be home? A: No. Many of our customers prefer to give us a key. Others leave a key in a safe place. Q: Do you wash dishes or do laundry? A: We do not normally do dishes. However, we do have add-on services for an extra charge. And yes, we also have laundry services. See brochure for information. Q: What is your cancellation policy? A: We require a 48 hour notice of cancellation of service. There is NO TERM to this agreement. Client agrees to pay at the time of service. Skipping regular weekly or every other week service may cause an adjustment to cleaning fee. Client will pay $25.00 per check for NSF (Non Sufficient Funds). JSCS reserves the right to reevaluate rates at any time. We make every effort not to break items, but accidents do happen. Identical replacement is always attempted but not guaranteed. For this specific reason, we request all irreplaceable items not be cleaned by our crew members. 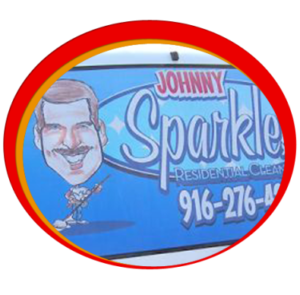 Although JSCS takes caution when using any cleaning products Johnny Sparkles is not responsible for damages caused by cleaning products or equipment provided by the client. JSCS will not be held accountable for damages caused by faulty equipment/appliances, improper installation of any item such as light fixtures and/or pictures and wall hangings not secured properly. JSCS is not responsible for cleaning up after pets. JSCS may cancel at any time for any reason.